www.maxforlive.com - WTF is this Max for Live thing anyway? If you are a musician who uses computers as part of your process, likely you've thought to yourself that you wish a music application did something that it didn't do. With Max for Live it's now very possible with some effort you could actually create that feature, instrument, or effect yourself. (or if someone else already had that idea, download their device from here with little effort). In this sense, Max for Live represents the ability for Ableton Live users to extend Live in any number of customizable ways. On the flip side, many artists who work in graphical audio/visual programing environments like Cycling 74's Max/MSP have likely thought to themselves that they wish they could leverage sequencing, preset management, and time sync of more standard music applications such as Ableton Live. 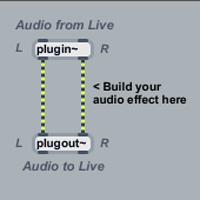 Max for Live represents the ability for these Max users to integrate their patches directly inside of Ableton Live to do just that. The possibilities are exciting. Check out Ableton's Max for Live product page for a closer look into what this is all about.